Crave Beauty Academy is a cosmetology school with locations in Wichita, Kansas and Ballwin, Missouri that is all about helping students to embrace change and excitement. Our programs in cosmetology, esthetics, nail technology, and cosmetology instruction are all designed to help our students to be competitive and successful beauty professionals. Our accredited 1500 hour cosmetology program is built to provide all the basic skills and understanding you may need to work with hair, skin, and nails for your clients. The program incorporates both classroom and salon floor education, allowing you to feel prepared for your career as a cosmetologist. Visit our cosmetology page for more info! Because Kansas and Missouri have different requirements, our accredited esthetics programs are 1000 hours in Wichita and 750 hours in Ballwin, and both can provide you the essential skills to become a professional esthetician. Skin analysis, anatomy, treatments, massage, and so much more are covered to help you be prepared to be a professional esthetician. Visit our esthetics page for more info! Our accredited nail technology programs are 350 hours in Wichita and 400 hours in Ballwin because of the different licensing requirements in each state. Both programs are designed to teach you the essentials of nail health, enhancement, main/pedicures, and so much more. This program can prepare you to work as a nail technician in a spa, resort, or anywhere else you can think of. Visit our nail technology page for more information! Kim McIntosh is the owner of Crave Beauty Academy, and is the spirit and beating heart of the beauty school! 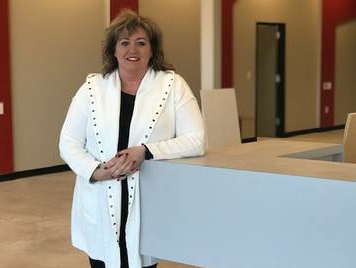 She has worked tirelessly to build a school that feels like a family and focuses on lifting up other people, whether it be students in the classroom or clients in the Student Salon. Lifelong education, hard work, and fun are all the tenants that Kim brings to Crave to make it an outstanding school. Crave Beauty Academy can be home for you if you want that personal touch and family feel! CULTURE is an important part of Crave Beauty Academy. Our culture is one that continually learns, works hard, and has fun while doing it. RELATIONSHIPS are a critical part of successful schools and businesses. Kindness and respect aren't just recommended at Crave, they're required. ACHIEVEMENT is how we measure our success as a school. If our students achieve great things, then we have done our job. VALUES can help make people who they are. At Crave, those values include accountability, balance, community, diversity, empowerment, integrity, and respect. EDUCATION is why Crave was founded above all else. We consistently update our skills and curriculum so our students can be better prepared to meet the demands of the industry as beauty professionals. Crave Beauty Academy is all about tapping into your passion for cosmetology, esthetics, or nails. Contact Us for more information on how you can build your passion to create a lifelong career! Major in Beauty. Graduate in Style. Learning looks great on you.